Once upon a time, there was a book . . . It was my very first picture book, and, as with much of my work, it was about the importance of shared stories. It was delightfully illustrated by Cat Bowman Smith. Like so many other books, it enjoyed good reviews, but, all too soon, it went out of print. 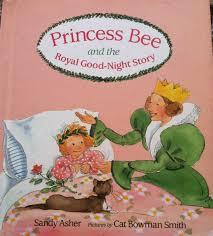 Years passed, I wrote many other books, but I never forgot Princess Bee. One day, in a far-off land of princesses, I attended a remarkable performance by the Oily Cart company and fell in love with the concept of Theater for the Very Young. My first attempt was an adaptation of another picture book, HERE COMES GOSLING. Then I picked up PRINCESS BEE AND THE ROYAL GOOD-NIGHT STORY and got a strong feeling that it could become a charming musical for the very young. I wrote the book and song lyrics. And I began my search for a composer to do the music. That search went on for years. The right person would be someone I could trust who knew music and theater . . . who understood very young children . . . and whose work I respected. I knew I would find that person. Eventually, someday, soon . . .
And then, I found him. The very talented Richard Biever, of State College, PA, who directed the first workshop presentation at Singing Onstage on July 9, 2014, has completed the score. The cast for his staged reading was wonderful, the audience was enthusiastic, and Rich and I learned a great deal about the script and continued working on it. Princess Bee, her mum the Queen, her dad the King, the Royal Big Sister, and the Royal Big Brother at last came to life on stage, and this story has not just a happy ending but continuing happiness. The first full production occurred on Friday, September 7 and 8, 2018, at the Lancaster Public Library. Another production by a company in Michigan is already in the works for the summer of 2019. NOTE: BEE’S stuffed toy might be a puppet pet that she manipulates to respond sympathically as needed. TIME: Once upon a . . .
PLACE: The Royal Palace. BEE’S bed up center. Royal breakfast table and chairs down left. SYNOPSIS: When her mum, the Queen, leaves on a trip to Goodness-Knows-Where for three whole days and three whole nights, Bee frets over missing her wonderful good-night stories. The Royal Big Sister and Royal Big Brother take turns filling in with stories of their own, though Bee protests that that’s Mum’s job and, anyway, their stories are too short. Mum never, ever runs out of story before Bee falls asleep. At last, Bee’s dad, the King, makes a suggestion that inspires Bee to search for the wonder of Mum’s stories deep within herself. “I cannot fall asleep without listening to Mum’s stories. But maybe if I listen very, very hard, I will hear one.” And she does. For more information or a copy of this script, please email me at sandyasher@gmail.com.